I'm always always a big fan for kovil pongal and esp on those marghazhi maasam where u'll get awesome prasadham very early morning.. This time I've decided to make this on Pongal and this is what I've prepared for 2day..
Slightly toast the moomg dhal until it's warm and soak it for 10 minutes..U can totally omit the moong dhal if u don want adding in pongal. Soak the rice as well for 10 minutes. Now in a pressure cooker add the water + milk and add the rice and dhal and pressure cook it for 2 whistles..(don worry ,the rice will be done cos of the prior soaking ..) Seperately melt the jaggery adding little water (may be half a cup of water) . Filter the syrup once it completely dissolves for any impurities. POur it back and cook until u get a single thread consistency ( U should get a thread when u take a pinch and press with ur index and thumb fingers..) Now slowly add ur cooked pongal into this syrup and add ghee. Combine well. Reserve some ghee for serving.. Now take a pan and add the ghee given in for garnishing and fry the cashews and raisins . 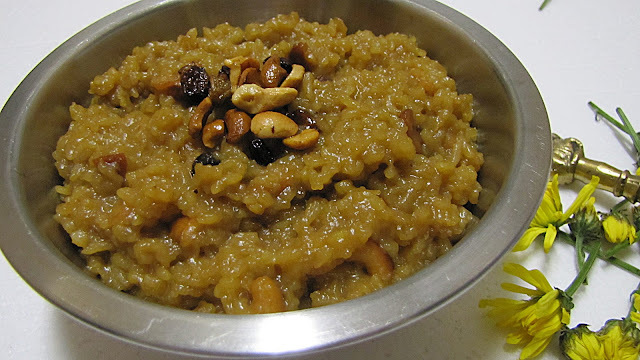 Mix the cashews,raisins,cardamom powder, pacha karpooram with the pongal and add a little bit of ghee on top while serving.. Now ur delicious kovil typa pongal is ready to gobble !!!!! lovely colour and mouth watering recipe. 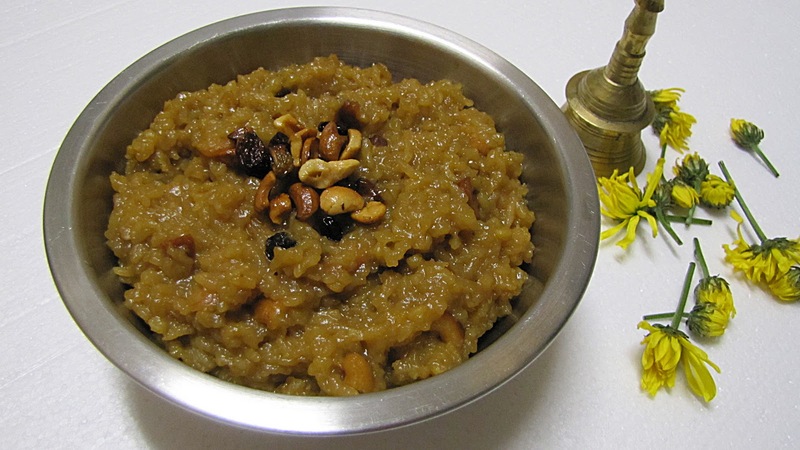 Happy Pongal to you,Sarkarai pongal looks delectable. arumai, arumai, arumai !-loved it ! 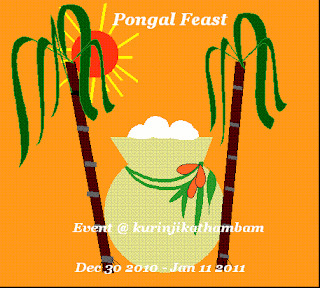 your pongal looks beautiful and shining..